Mark Mummert - Biological Technician - Condor Country Consulting, Inc.
Mr. Mummert has performed a wide range of work at CCCI, including protocol-level surveys for western burrowing owl, monitoring and maintaining wildlife exclusion fencing and nest buffers, and compiling project reports. Mr. Mummert has conducted pre-construction surveys for nesting birds, managed nest start removal within project areas, and monitored Swainson’s and red-tailed hawk nests. 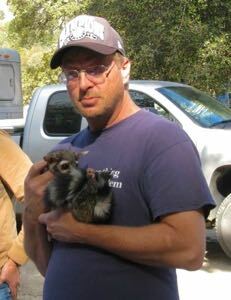 Mr. Mummert's work with mammals includes mist-netting bats, and live trapping and radio tracking ringtails. Mr. Mummert is skilled in botanical surveys, habitat restoration, and identification of invasive plant species. He has conducted rocky intertidal surveys and fish surveys (including electrofishing). Mr. Mummert is familiar with CEQA, NEPA, and FESA regulations, and is experienced in both GPS and ArcGIS.